Outtake from Siberia, A Cultural History, published by Signal Books (UK) and Oxford University Press (USA). From the late 1960s or early 1970s, a Russian environmentalist movement sprang up that fit in well with the idea that nature begged conquest by an all-powerful Soviet system. The movement attracted ecology or outdoor minded people, such as the climbers and adventure hikers – the so-called ‘Stolbyist’ free soloing climbers – who were clinging headfirst from rock pillars in a nature reserve outside Krasnoyarsk. Others were scaling the sacred mountains of the Altai or paddling its holy rivers, and some combed the trails of Baikal in small groups, singing songs of enduring friendship or patriotic ditties while bearing the Soviet standard. Despite Soviet atheism (or probably because of it), the wilderness became a mystical or sacred refuge. Baikal lends itself perfectly to this, and we heard of one inspired post-Soviet Moscow poet who brought with him to Lake Baikal a pair of luridly coloured foam “shoes” – after a very long night on vodka, he intended to walk across the waters to the other side. I never heard what became of him. While the “flag-and-patriotic-song” brigade has lost ground in recent years, the spirit of the age lingers and can still be found in the unusual way Russians hike: typically, they are dressed in army-style camouflage trousers and khaki shirts and can be found scampering along dangerous cliff-faces with enthusiasm. Some hikers are prepared for any eventuality (bears, ticks, roaming dogs in villages, collapsed bridges, to name a few). Others are less-prepared, driven by a raw, post-Soviet desire to stride the natural wonders of their country. Generally speaking, this movement of the 1960s and 1970s scorned the banal triviality of Soviet city life and plunged head first into Russia’s wilderness. It didn’t get much wilder than Siberia. Sometimes this was in the extreme north, which was seen as a place where you could test your mettle. Baikal was another popular place to do this. One group of Muscovites I happened to encounter while researching around Lake Baikal struck me as being a modern variation on the theme. I liked the Muscovites. I met them on the high-speed hydrofoil from Irkutsk to Bukhta Peschanaya (Sandy Bay), a spectacular stretch of Baikal shore with two tourist bases. One of these tourist bases is an upmarket complex on an archaeological site, the other a “proletarian” string of huts along one section of the bay in a pine grove. They were staying in neither. I admired their sense of adventure. They were nervous. Pyotr, who was already wearing his camouflage pants complemented by a chequered shirt straight from the Woolworth shelf, warned about the hazards posed by the infectious tick, which he described as “a dangerous animal” (I thought at first he wanted to warn me about bears). All seven were visibly impressed when I showed them my plastic tick remover. Unlike the high-pitched anti-dog whistle, which so far had served me well against a vicious dog in Tobolsk, I wouldn’t need to use the tick twister, and I later regretted not giving it to them. One of the three women in the party wore jeans that exposed her brown belly. Another was in khaki, made sure every inch of skin was completely covered, and had a mosquito hood at the ready for her face and neck. It was hard to know what she was dressed for, invasion or adventure. No roads lead to Bukhta Peschanaya in summer. Once Lake Baikal ices over, an ice road is cleared across the frozen surface. Not even the ubiquitous mobile phone works here. When the boat arrives a few times a week, everyone who is already here drifts down to the jetty to see who is disembarking. It is a strangely touching ritual. 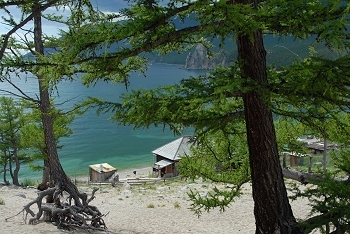 The in-coming disembark with a sense of arrival in Paradise – one of squeaky Baikal sand and where trees are described as “walking” because their roots are exposed like stilts in the dunes; the departing bid farewell with faces contorted from the strain of carrying their luggage, and somewhere between Heaven and Departure, those who are staying on in Peschanaya stand or sit around, alone, with families, or in groups with friends, staring with mild curiosity at the comings and goings. Sergey disembarked. With 12 bottles of vodka, with four times as much beer, and with three friends. 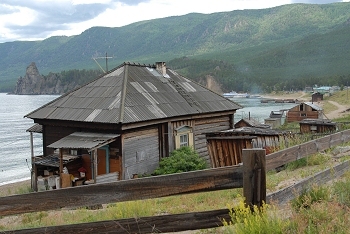 He was another I met on the boat, and within a few minutes of landfall he began chatting up a pearly young lass from Krasnoyarsk in the settlement’s veranda-shack restaurant. This was a Gilligan’s island-type establishment whose mainstay is simply prepared but delicious Baikal fish. The Muscovites found a spot in front of the shack to make a few last-minute preparations. Vasily was fussing over his equipment, overseen with interest by the lass from Krasnoyarsk, who stood slightly sway-backed on the veranda clutching a bottle of beer in her hand surveying the scene sceptically like it was all going to end in a Sam Peckinpah movie. Pyotr had already familiarised himself with Baikal’s cold waters. Mid-summer, the temperature should be 15 degrees. A woman who helped run the main turbaza warned me that it was only 6 degrees. Later, I would find the water was so cold that my feet went numb before I finally mustered the will to hurl myself into it. Eventually, the Muscovites were ready. I walked back up to the veranda. Four years had passed, and I thought they should enjoy this moment alone. Read my interview with Ed O'Neil, who at the time of the interview headed Logistics at Caterpillar.